If you like fish and chips, Spuds at Alki Beach is one place you'll definitely want to eat at while you're visiting Seattle. First of all, seafood and Seattle definitely go hand in hand. 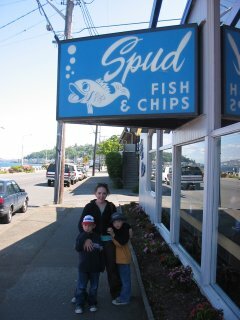 We have had some great seafood dishes on our trips to the Northwest and the search for some good fish and chips was successfully ended at Spuds on Alki Beach. There are two Spuds restaurants, one in Kirkland and the one here in Alki. They're owned by different people (the Kirkland one is privately-owned, while the Spuds on Alki is owned by Ivars), but they are exceptional places to get some greasy food that tastes good. If you only have time to go to one, though, we would definitely have to recommend the one on Alki Beach. 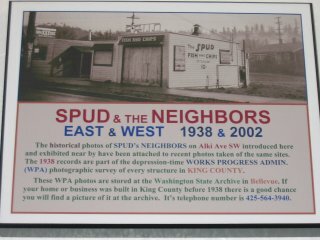 Spuds bills itself as "the oldest fast food restaurant in Seattle" and it's amazing that it's still around after all these years. First of all is the food. The fish is cooked very well, and is not at all like the "beer-battered" fish you get at chain restaurants around the country. The thickness of the batter is just right and the seasoning they use is perfect. That being said, if you're not into fish or chips, you can also try the clam chowder which I hear is pretty good. The second best thing about Spuds at Alki is the view. If you don't want to take your food and head across the street to the beach, be sure to head upstairs and sit by the long window where you can look out on the water and people watch. The address is 2666 Alki Avenue SW, but just look for it as you drive down the beach and you won't miss it. Back from Spuds at Alki Beach.